We had a very special guest for this episode – Steph Lee from Host Agency Reviews. I’ve been getting a lot of questions from people who want to get started in the industry but have no idea where to start. I’ve been sending people to the Host Agency Reviews website, but wanted to go one step further and actually have a conversation with Steph on the podcast. I really enjoyed our conversation, and even though I knew a lot of this, she added some insight to things that I hadn’t considered before. Even if you’re an experienced agent, I think you’ll enjoy this episode. Links to any resources are below. There is no worksheet or download for this episode. Christy: You’re listening to the Travel Geniuses podcast, for travel agents who love planning vacations for their clients, but wish the business side of things was just a little bit easier. This is episode 8 and I’ve got a great guest today, so keep listening. Hey Travel Geniuses, Christy here, thanks for joining me for another great episode of the podcast. Just want to give you a little heads up. My mic started glitching out on me about five minutes before this interview started, so my audio, I don’t think it’s quite as good as it normally is. I’m trying to figure out what I want to replace this one with, so if it sounds a little off, that’s why. 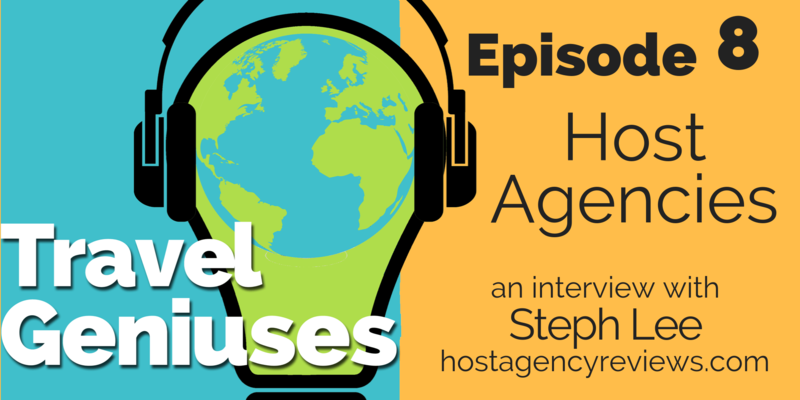 Other than that, this was a really great interview with Steph Lee from host agency reviews. It’s a great website with most of, if not all of the major host agencies listed and agents who have worked with them are able to go in and rate and review these host agencies. So it’s a really great tool for new agents just joining the industry who are looking for a host for the first time, and also for those of you who maybe are looking for a change, if you’ve been with your host for a while and there are some things maybe that aren’t working for you anymore. It’s a great resource. Christy: I’ve gotten a lot of questions from listeners who want to become travel agents and don’t know where to start, so I thought Steph would be a great resource to be able to point them to and so I wanted to talk to her to help answer some of those questions. But even if you’re an experienced agent, I think you’ll enjoy this interview with Steph. She’s so sweet and it was really fun to talk to and I learned a few things talking with her as well. She just added some different ways to think about things that I hadn’t really considered. So I hope you enjoy the interview and let’s go ahead and jump right in. Christy: So I guess we’ll go ahead and get started. I want to start by asking how you ended up starting Host Agency Reviews and why you did? Steph: And at that time there was also a huge problem in the industry of there not being enough people coming in. And it wasn’t an attractive industry and I wanted to show people the other side of it and that it was possible. And that, just because you don’t see a storefront travel agency every 10 miles doesn’t mean they’re not still around. They’re just in a different form. Christy: And how long ago was that? Steph: Yeah, I started this site, um, I think it’ll be seven years this February. Christy: It’s amazing, isn’t it? How much the industry has grown and how many more people are starting to join it. It’s exciting to see. Steph: It’s so great. And I actually just got off the phone right before this. I was on the call with Ann Chamberlain with, ASTA and she is the head of NACTA, which is now their small business network. And we were talking about… So when Ann and I met, when she took the job at NACTA, it was probably 7, 8 years ago. And I remember ASTA had just switched over to having Zane as the head and it was just a real transition time and they had tried other CEOs and they hadn’t really worked out. But talking about how over the last 7 or 8 years, how the industry has just gained so much momentum and ASTA is kind of an example of that with how many agents are joining it and how their global convention is so successful. 10 years ago or 12 years ago, when I first started going to their conferences, there was barely anyone there. And now it’s, you know, it’s growing and it’s flourishing. And it’s the same with the independent contractor model. I think everyone sees how important host agencies are to the ecosystem and supporting ICs. Christy: Yeah. When I started, it’s been over 15 years I think now. So being an IC, or a home-based agent was… you kind of didn’t really want to bring it up when you were out, and meetings and things because people didn’t respect you or thought you weren’t a real travel agent if you didn’t work in an agency. But yeah, it’s exciting to see the changes. Christy: So why don’t you, if you don’t mind, just explain what a host agency is because I’ve been getting emails from people who want to become travel agents and they really don’t know anything about the industry let alone… My first response is to tell them you have to find a good host. They don’t even know what that means. So let’s start there. Steph: Yes. Well, so a host agency, I think technically speaking, it’s a travel agency that shares their accreditation number with other travel agents that are their own entity or independent contractors. But that’s, you know, very technical. I think about host agencies as kind of a back-end assistant for your agency. So they make it more plug and play for you. You don’t need to get an accreditation number because you’re using theirs. And that means that you don’t need to set yourself up with every single vendor under the sun, otherwise you have to send in all your information to any vendor you want to book with to get set up with the logins. You, you get your top tier of commissions right away because host agencies are a bit of a loophole in the industry in that the vendors see you as one agency, because technically you’re using one accreditation number. And so they’re saying, “OK, this accreditation number is bringing in this much in sales.” Even though it’s really coming from hundreds or thousands of different agencies that are underneath that host agency. But that makes it so that all of those agents are able to be at the 15% or 16% commission level instead of starting at 10% or 12%, whatever the vendor has worked out. Christy: Okay. And then they typically will take a split of your commission. So if they get 15% and they keep, I’m not going to be able to do this math now, 30%, then you get the remaining amount. Steph: Yeah. So typically in exchange for working with a host agency, some agencies will have no monthly fees for their plan, and that’s a great option for agents that are new to the industry and don’t really want to have to be putting out money every month if they don’t know they’re going to be selling. But just think of it as the more you pay a host agency each month, the more you get to keep. So host agencies will have even 100 percent commission plans, some of them, which means for an agency that’s selling a lot and is really established, it’s actually a great deal to get, say 100 percent commission plan for 150 or 200 bucks a month. Because that’s going to be at Max, let’s say $2,400 a year. That’s much cheaper than having a back-end person, an assistant help you out because the host agency also cashes all of the commission checks, does all accounting on the back end for you… You still have to do your invoicing so that the host agency knows that this is your booking and the commission should go to you, but they simplify a lot of things on the back end and they also then have to have a lot of technology that then you don’t have to purchase. Christy: And that increased commission that your host agency is earning more than you could get on your own anyway. So it’s a good deal. Christy: What should an agent look for in a host? If you’re a new agent and you’re looking for a host agency, what are some of the criteria you should consider to see which one is a good fit for you? Steph: Well, I, well I’ll start by saying that for new agents it’s not abnormal to switch host agencies within your first couple years. And the reason isn’t because you sign up with a bad host agency and, you know, anything like super negative. It’s more along the lines of – you’re learning an entirely new industry. Your business model might change, your niche might change, you might discover that, “Oh, I really, really need this and I can get it for $50 a month cheaper at this other host agency .” But, you know, as you’re figuring out the industry, then you know more what you need. And then oftentimes when that happens an agent will end up moving around a little bit. Steph: But having said that, when you’re new and you’re starting off, I think the most important thing to listen to is kind of your gut feeling on what the cultural fit of this agency is. Because your host agency is going to be your business partner essentially. And if you’re a very fun, loving and free-flowing person, going with a corporate agency that has a real corporate feel, may not be the best option for you. So, when you’re talking with host agencies, ask them if you can speak with any like an agent or a couple agents that have started their company within the past year. Because those agents have just walked in your shoes and they can give you an idea of what it’s like to be with this host agency and what their agent community, what their responses to new agents is and how helpful they are. And you should also be asking if there are certain vendors, like if you’re specializing in cruises, and if you really love Disney cruise cruises or you love carnival cruises to ask what those commission levels are. s really important to able to compare apples to apples. Although I’ll put on a disclaimer that any large host agency is essentially going to be at the exact same commission levels at the top tier for any of the vendors. Christy: But some, I suppose, would maybe have better relationships with some of them. Maybe if they, I don’t know, are there host agencies that specialize in like adventure travel or maybe have closer relationships with those companies. Steph: It depends on the company, so if we’re talking mainstream vendors, any of the large host agencies, you know, once you’re getting past $50 million in sales, you’re going to be a large account for pretty much any of the main vendors. But if you’re looking at more boutique agencies that specialize maybe in adventure, specialize in groups, or specialize in destination weddings and honeymoons… and within that, if you are selling a certain product that isn’t necessarily mainstream, that’s where you can really find differences between host agencies, but if it’s an obscure vendor, it’s going to be very difficult to find a host agency that sells a lot of. Christy: Most of those smaller companies don’t pay more than usually 10 percent commission anyway. Is there anything else that you think is important to look for? Steph: Well, I think one thing for experienced agents, because they’re established in the industry and they know what they want from their host agency and what they need. One thing that they should be asking is not just what the commission levels are, but how do communications with the sales rep, or the BDM work, because every agency has different internal operating procedures. So what they’re used to at their current host agency, or even if they’re working in a storefront, may be different with this host agency. So asking “What happens if I want to use some co-op dollars? How do I go about getting those? How are those allotted to different agents?” And then, I guess this is important for both new and experienced agents, but especially for experienced agents because they usually have more income that’s going through the host – asking what happens to the bookings if they decide to move to another agency and making sure that that’s in the contract. Because that’s a problem that people do have, is they decide to leave, but then they need to stay and pay host fees for the next year because they have commissions that are coming through. Steph: So understanding that, and also understanding what happens if you forget to invoice your booking and your commission comes into the host agency. They don’t know it belongs to you. So asking them what happens, how are those handled? Does the host agency proactively send out a list of all of these” Or is there a place in the forum that I can look up the unclaimed commissions? Or is this like on my end that I need to make sure and follow up? Christy: That’s a good point. And then back to the BDMs. I know Trafalgar… I believe they have a BDM who works with independent agents. So typically if your host agency is local, your BDMs are local too, so you have the opportunity to meet with them or have maybe trainings at the host agency office or something. But if your host agency is in Florida and you’re in California, they’re usually territorial. So you won’t have anybody local. Are you seeing any changes to that? Steph: Yes, there’s actually been quite a few vendors that have moved to having host agency BDMs. But then also I was actually just talking to the local BDM for Apple Vacations and now with this merger with Apple Leisure Group and Mark Travel, she was talking about how her and her counterparts are going to be working together. Because if you think about it there are so many independent agents that are under host agencies right now. If the company, the vendor just assigns one BDM to host agencies. That’s insane. Like their territory is huge. So Cindy was explaining to me that the way they’re breaking it up is they’re actually having kind of regions for the host agencies. Because traditionally BDMs have been had territories and they were very protective of their territory. But now it’s more of a collaborative approach, which is exciting to see. Christy: That’s good. I’ve been lucky that my host agencies, I’ve worked with two and they’ve both been local, so I was really able to take advantage of meeting with the rep. So for those of you who don’t know, a BDM is a business development manager and it’s basically like a salesperson for the tour companies, and they would visit with a travel agency and bring lunch sometimes and do trainings and things like that. But they support you and help you make your sales and then they get credit for that somehow on the back end. I don’t know what their world is like. So it’s really nice to be able to meet with them even sometimes if you have an issue that you need help with, with a client, they can kind of step in sometimes and help. So it’s really nice to have that person local that you can go to if you need assistance. So that’s, I’m glad they’re doing that. I feel like, I think maybe because I’m so in the ice world, it feels to me like there are more ICs than brick and mortar agents now. Steph: There are. The tables have turned and it’s definitely the majority of agents are now independent, which is a challenge for vendors because independents are notoriously hard to find and know where they’re at and what they’re doing. Christy: We had a group here when I first started, I was so lucky. Like I said this is like 15 years ago, it was almost unheard of to be a host agency and my agency was just a host and there were at least 20 of us that would get together every month and so the BDMs loved it because we would invite one of them to come to every meeting and they got to sit with 20 of us at least at a time, so it was really nice. I’m glad they’re changing that. Christy: Then one other thing I wanted to talk about as far as things people should look for is training. I don’t know because I’m not up to date on all the host agencies, but what different training options are available or what should a new agent look for if they haven’t done this before? Steph: Well, there is everything underneath the sun available for training, so I always tell agents when they’re asking us about trainings is that you’re not going to have a lack of training. The problem is going to be that you have too many trainings, the suppliers, the destination, everybody has trainings. The host agency is going to have trainings and when it comes to hosts, there’s a lot of different options available. So I think it comes down to you determining what type of learner you are and what type of help you need. For me personally, I’m not a person that does very well with a lot of handholding and having to do assignments or checking in all the time. I’m a lot more of, I like to get a little information and just kind of go into my rabbit hole. But for agents that need more handholding, different host agencies will offer different training programs that, typically they’re going to cost more, but will have more hands-on and cheerleading. But you know, you do pay for that. So some people are totally fine with that because that’s what they need and they want to be able to have access to a mentor and all these different things. So it’s, it comes down to whether or not you’re more of a DIY, or if you’re a person that likes more guided education. Christy: And then I want to talk about how to avoid unethical hosts. I heard some rumors. I think it’s a rare instance, I think most are good, but how could somebody vette that? And then maybe in the same thing, I don’t know if you know a lot about the multilevel marketing companies that tout themselves as like, “Oh, you can get a travel agent ID and travel for free.” How can somebody make sure they’re working with a good host that really does have their best interest at heart and wants to help them grow a business, not just, you know, pad their bottom line. Steph: Well, I will say that if you go to our site Host Agency Reviews, we have the largest directory of host agencies out there and the most reviews of any site that’s out there. And it becomes very clear to us on our engine. It will be very clear to you if you click on the profile of a host agency that isn’t paying commissions or that maybe doesn’t have the best reputation. So what I mean by that is, so you go on our host agents list, you click on any host agency and you know, if they have 100 reviews, they’re probably gonna have 1 or 2 negative ones and that’s just the numbers. But the problem comes in when you have a host that has 10 reviews, or 8 reviews, and half of them are negative. Or even a quarter of them are negative. That’s not a very good sign. Steph: Agents have trouble differentiating the host because people that belong to a host agency love their host agencies and usually put lots of great things about them. But I always tell agents to read between the lines so, what our agents liking and what are they saying? What aren’t they saying? And to find those trends. If you think training is really important to you. Make sure you’re looking for that in the reviews. So you’ll be able to tell a bad host agency pretty quickly. And if they don’t have any reviews on the site then we always encourage agents to call them and tell them, “I am interested in you, but I don’t see any reviews on Host Agency Reviews.” Just to try to get the fire underneath them because we don’t know if we haven’t seen any reviews come in, we’re not sure what’s happening on the front. Christy: Yeah. And I did have one of my host agencies… I went from a really big one to a really small one and she only had two or three ICs. She was a brick and mortar travel agency and just took on a couple of ICs. So she wouldn’t even be listed honestly. So just because they’re not listed doesn’t mean anything. But sometimes you have to use your best judgment. Steph: If they’re a large agency, they should be listed. If they’re a local host agency that only has a couple of local agents? They may or may not be listed on the site. Christy: Anytime somebody asks me about starting like I want to be a travel agent, where do I start? I always send them to your site. So even if you don’t know what a host is or lots of different industry terms, just reading the reviews will help you. You don’t know what you don’t know and you don’t know what to look for if you’re a new agent. You know nothing. So just reading the reviews will help you pick up some things that may be important to you that you didn’t even consider before. So yeah, I love that you have that site. Steph: Yeah. Well we also have an Excel sheet that’s really helpful for new agents and I’ll send you the link for it, but it essentially gives them questions to ask the host agency. Like, do you provide E&O Insurance? Do you have seller of travel licenses in these states? And then there’s also a link to articles, like if you’re like, “I don’t know what a seller of travel license is”, then there’s a link to the article that will educate you on that, and a link to an article on E&O insurance. So it’s really helpful for keeping everything straight when you’re interviewing host agencies. Christy: Brilliant. Okay. Well thank you so much, Steph, for taking the time to talk to me. I know I really enjoyed it. I know a lot of this stuff already, but I really enjoyed our conversation and I know everybody’s going to find it useful and interesting to listen to. But if they have more questions, where should they reach you or find you? And of course, they’ll have these links in the show notes as well. Steph: Yes. And just really quickly before I jump into that… For travel MLMs, if you go to hostagencyreviews.com/travelmlms, there’s a great article on them and who the main players are right now, and how to tell them from an actual host agency. Steph: But, if people are looking for more information, they can go to hostagencyreviews.com/newsletter and they can sign up for our newsletter. It goes out once a month on the full moon and it has a picture of my dog and an astronaut costume. He gives a little space advice, every newsletter as well as a lot of travel industry advice in there. So that’s a great place to keep up with us. And then you can find us on Facebook or I’m also on facebook and my handle is iamstephly. Christy: Okay. Well, thank you. I will have all those links in the show notes. Thanks a lot. Steph: Thanks so much, Christy. Christy: So that was fun, right? I really enjoyed talking with Steph and I hope you enjoyed listening to her thoughts on host agencies, and that you learned something that was helpful, but I just wanted to pop back in here before I end this episode to let you know that Steph did create a really great page on her site. You’ll find that at hostagencyreviews.com/tg, and she’s got a lot of links to all of the ones she mentioned in the podcast as well as some additional resources and articles that she thought would be helpful for you guys to look at. So make sure you check that out. I will have that link in the show notes if you’re not able to write it down right now and that will be at travelgeniuses.com/episode8. Christy: In the next episode I’m going to talk about what we call ourselves. You know that debate on – are we travel agents or travel advisors? I’ll give you my thoughts on that and I think you’ll be a little surprised. I don’t think it’s what you’re going to expect me to say. Or, maybe you will. Who knows? So look for that episode next. And in the meantime, as always, please share this with your travel agent friends. I’d love to reach as many agents as possible. And I’m loving your reviews you guys on Itunes. A couple of people have left some really nice reviews and I was just thinking this week about how incredibly nice that is that somebody would take the time to write those reviews up and submit them to iTunes. I listen to podcasts all the time and I don’t think I’ve ever written a review for someone which makes me feel really bad. I need to get on that, but those of you who have done that, I really, really appreciate it more than you will ever know. So with that, have a great week and I will see you in the next episode.